Everything we see and read about Donald Alexander Smith shouts of convention, hard work and moral standing, for example his philanthropic work, even his motto was “perseverance”. Arguably, one area that demonstrates a different side to Donald’s character was through his relationship with Isabella. They met while Donald was working in Labrador, Canada in the early 1850s. At this time she was actually married to a cousin of Donalds, John Grant, who married in 1851. The whirlwind romance between Isabella and John, however, was not to last and they, unusual for the time, separated in 1852. It was Isabella who took charge of their son, John. She was repudiated to be a very strong woman who knew her own mind and she had set her sights on Donald Alexander Smith. 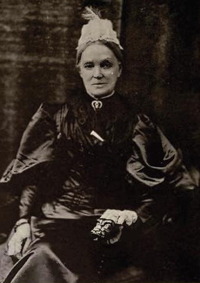 Donald and Isabella’s relationship flourished in 1855 and they had a child, Margaret Charlotte Smith on 17th Jan 1854. They were not actually married at the time, which was scandalous for the era. Donald was a man of principle and so this behaviour is perhaps out of character and demonstrates the strength of love between them. They were married in June 1859. 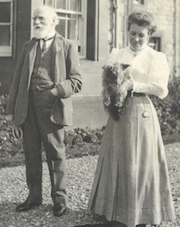 Such was his love for Isabella, Glencoe House was to be a grand love letter from Donald to Bella in celebration of their life together. There are many symbols on the building that reflect this, for example their initials DAS and ISS. The separate initials were to demonstrate that Isabella was an individual in her own right, again reinforcing the impact of her character. They enjoyed a long union which was only to be broken on Isabella’s death on the 12th November 1913.